The master bedroom is complete and we moved in this weekend. 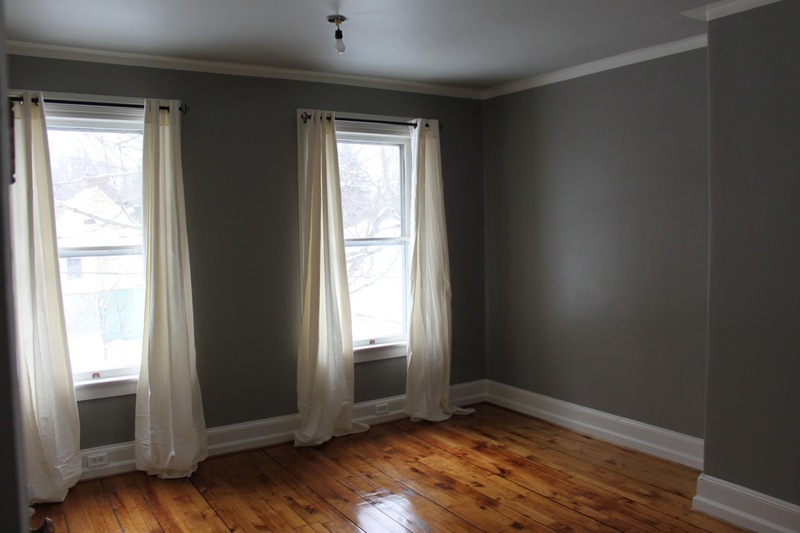 I have a touch up of stenciling to do, but other than that — it is a livable, decorated space. 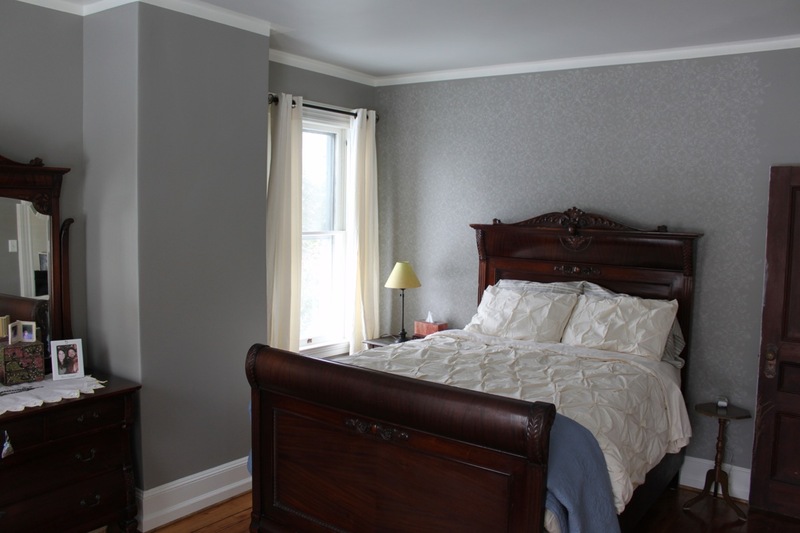 You can see that we completed the paint job by painting in a cornice moulding around the top of the room in the trim color, leaving the lines crisp. 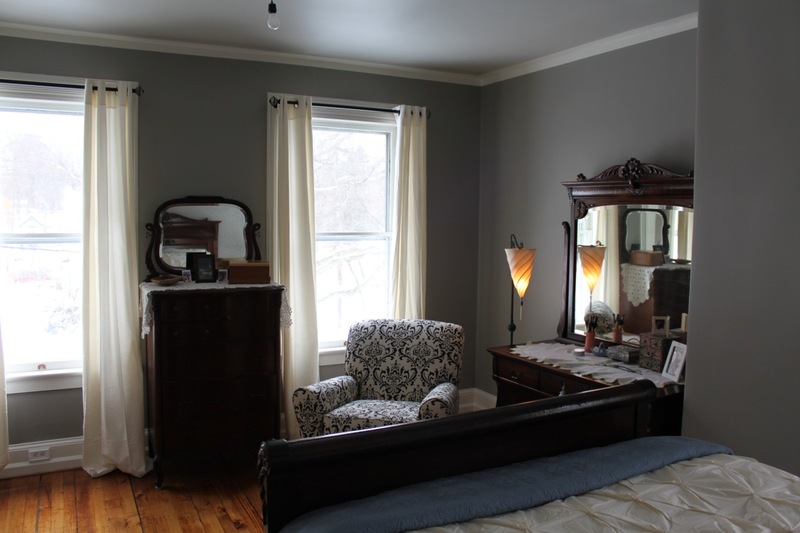 Without the furniture, it looks rather tailored and formal, unlike the frilly Victorian feel the room would have originally had, likely with flowered wallpaper. So, the stenciling should help that feel quite a bit. As I mentioned earlier, I may go ahead and stencil the whole room, but I’ll have to sit with that for a while before I take the leap. Doing one wall is weeks worth of work. The wood furniture is turn of the century, coming from my grandmother’s cousin’s parents, known in the family as Uncle Gus and Aunt Ella. The bed, dresser and gentleman’s bureau were their personal bedroom furniture. I am very lucky to have these pieces as they fit beautifully into our home and are in wonderful condition. The black and white upholstered chair was my Christmas gift from Bill. I had wanted a nice glider or rocker for the baby’s arrival, but something that would endure many years and not look dated. This is what I chose, a glider that is also a recliner. Very comfy and a nice contrast to the solid gray walls. 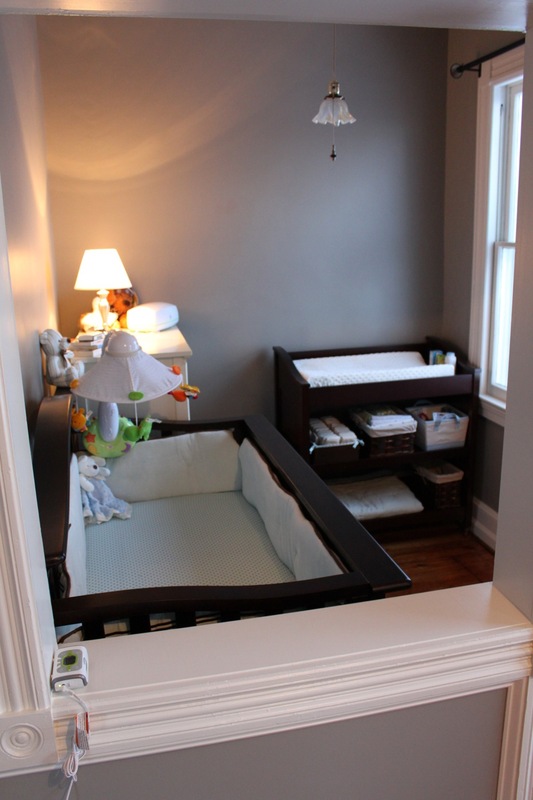 The nook is also completely furnished with the baby’s goodies: crib, dresser and changing table. We’ll plan to have the baby with us in the nook until his room is ready for moving in, likely at least five months. Now that we’re all moved in, we’ll be taking a close look at our old bedroom, the octagon room, and deciding how to attack it next. Eventually it will be the baby’s full time room, to be decorated in turquoise and chocolate with a Peter Rabbit theme. (You can tell I’ve been ready to do this one a while.) Pictures and process yet to come! Wow! Truly amazing, friends. Honestly, I am welling up with tears right now! It is beautiful. I wish I were there to see it in person. The bedroom and the nook look great. I love Peter Rabbit. I always remember reading the Beatrix Potter books as a child. I’m sure the baby’s room will be terrific! Thank you; yes, B. Potter was drawing around 1900, so her work will fit perfectly into the house. And the stories are so charming. Gorgeous, Karyn! Good call on the glider/recliner and congrats on the upcoming arrival of your little one 🙂 You have the patience of a saint to do that stenciling–it looks wonderful! Thanks Lori; I wouldn’t say it is patience so much as one of those things that you just start doing and it becomes meditative and peaceful. You know, how some painting can be. 😉 Or, I’m just really bored. 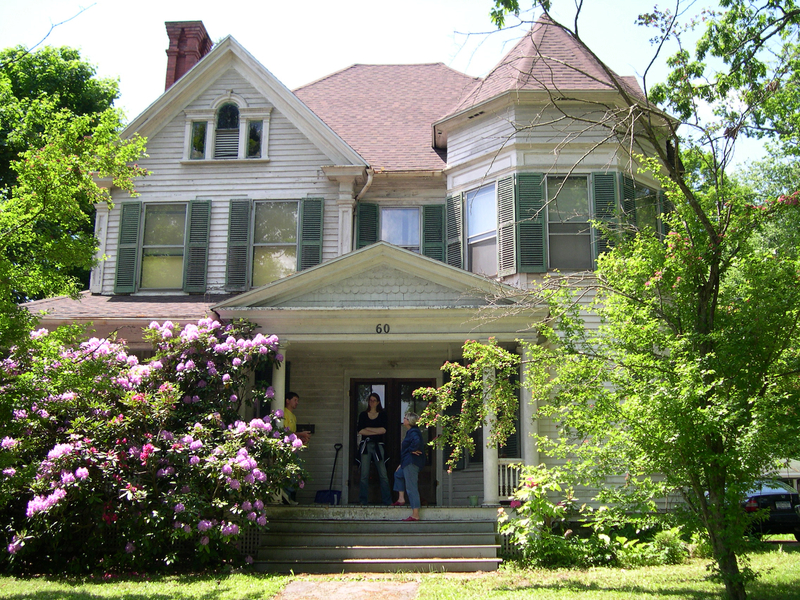 Karyn, it’s so wonderful to see this lovely old house being loved back into such amazing condition! And how delightful to think it will ring with childish laughter again soon! Thanks Diana! It is truly a loving relationship, goes both ways. The house gives us so much in return, it really does. It is a pleasure to work in and on. how wonderful! look forward to seeing it in person! what a great job the two of you are doing with it all! Previous Previous post: The Master Bedroom is Complete!